Eagle Buildings offers a lease-purchase program, oftentimes called rent-to-own. It’s easy to get signed up. There is no credit check, and everyone is approved. All we require is a small security deposit (ranging from $100 to $200 depending on the size of the building) and the first month’s rent. We offer 36 month contracts. Visit our Product Catalog to browse through a few of the buildings, carports or portable garages that we offer. Contact our location nearest you for pricing information. Eagle Buildings also offers used building options. If you are searching for a used storage building to purchase, give us a call or come visit the location nearest you to see what is available. Our inventory is constantly changing so check back often to see what is available. Our Liability Damage Waiver program, LDW for short, gives our customers protection and peace of mind as it protects them from liability during the term of the rental agreement should an act of God affect the building. Our LDW program is typically more affordable than adding your storage building to your home insurance policy as the monthly cost is only 10% of your total monthly rental payment. For example, if your monthly rental payment is $135.00 (including tax) then LDW rate is $13.50 per month! There is no deductible and coverage continues as long as you make your monthly rental payment and LDW payment. With LDW coverage, we will repair or replace structural damage caused by natural disasters such as a storms, tornadoes, fire, etc. (*Please see the full Liability Damage Waiver Agreement for full details.) The LDW does not cover items inside the storage building and the program does not waive any responsibility resulting from customer misuse. If you have further questions about our LDW program please call 270-248-7562 or fill out the LDW Request Form for more information! Eagle Buildings will make one free delivery within a 50-mile radius of your sales location. If the distance to your location is greater than 50 miles, there is a $3 per mile one-way charge. See how far away you are from our nearest location. 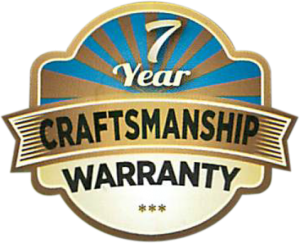 We offer a 7 year craftsmanship warranty. quality construction, and quality workmanship.